If you're conscientious about safe and healthy kitchen practices, you'll want to address a prime opponent: open seams on your countertop. They can quickly fill up with crumbs and food debris and become a breeding ground for germs and bacteria. But you don't need to hire a professional for this job. If you've ever used glue to rescue a favored possession, this repair should be right up your alley. Seam filler usually is sold in an array of colors, so choose it carefully. Remove any dirt and grease from the countertop by cleaning it thoroughly. Read the directions on the laminate seam adhesive and filler; some products recommend water only, some soap and water and others acetone. Let the countertop dry. Snip off the top of the laminate seam adhesive and filler with scissors. Squeeze a pool of the filler onto a piece of cardboard. Dip an artist's paint brush into the filler. Press some of the filler into the open seam. Wait a few minutes for the filler to settle and harden within the seam. Run a putty knife over any excess filler that spills onto the countertop. Wipe the knife with a paper towel. Check the drying time of the filler. 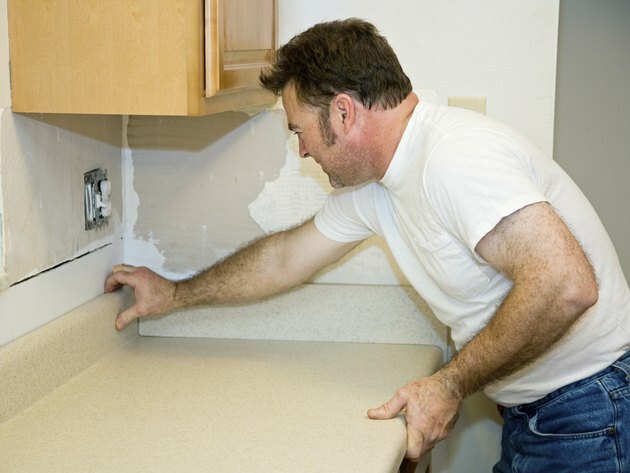 Once that time has elapsed, assess the filler to ensure it is level with the countertop. If the seam is deep, or the adhesive shrinks while it dries, repeat the application. Give the filler time to cure, which could take up to 72 hours. Keep the seam free of obstructions in the meantime.